Some wildlife throughout New Mexico have become stressed and or displaced by drought conditions or most recently by wildfires. While at first glance the animals may appear to be lost or abandoned, they usually do not need to be rescued. 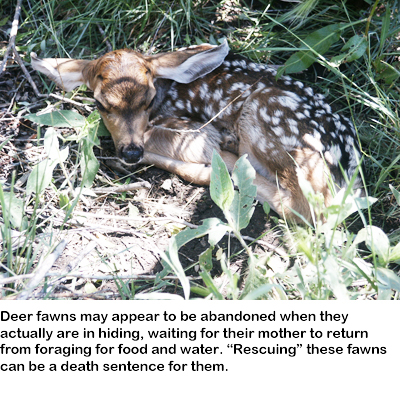 The Department of Game and Fish is reminding people not to “rescue” animals such as deer fawns, elk calves, bear cubs, baby birds, or others that may appear to be lost, injured or abandoned. Most often, the wild mothers hide their babies while they forage or drink. Usually, mothers are closer than you think. Removing young wildlife can drastically decrease their chances of survival. It becomes very difficult to return wild animals to their natural habitats once they have been in close contact with humans. Handling wild animals also may increase the risk of picking up diseases and or parasites. Only licensed wildlife rehabilitators can legally care for injured wildlife. “It’s never a good idea to pick up wildlife that appears to be lost or abandoned,” says Chris Ortega, Las Cruces District wildlife supervisor. "It is natural for young animals to be left alone so their mothers can feed, and to protect them from predators. If you find one, it's always best just to admire it from a distance and quietly move on." Deer fawns are born without scent, and their spotted coats are very effective camouflage. Often, fawns will hide motionless for hours before their mother returns from feeding, or after luring predators away from her young. Baby birds often fall from their nests or are pushed out by parents encouraging them to learn to fly. Birds on the ground usually learn to fly quickly. People can successfully return them to their nest if they do it quickly, but it usually is best just to leave the birds alone. Every year, the Department receives calls from people who find young wild animals and take them home or to an animal clinic believing they are helping. Actually, that is the worst thing they can do, Ortega said. Young wildlife rarely survives when removed from its natural habitat, and close encounters with humans and their pets can be fatal. Young animals can become stressed and not recover. Too much contact with human and pet scents also may prompt the mother to abandon her young, he said. "It's important that people also understand that not all young wildlife survives," Ortega said. "Mortality is natural. The best way we can help them is to leave them be." While the department appreciates public concern for wildlife, people are encouraged to leave wild animals alone. If animals appear to be injured or a safety threat, people should call the Department of Game and Fish. Reports can be made at offices in Santa Fe, (505) 476-8000; Albuquerque, (505) 222-4700; Raton, (575) 445-2311; Las Cruces, (575) 532-2100; or Roswell, (575) 624-6135. For more information about keeping wildlife alive and people safe, please visit www.wildlife.state.nm.us and click on the “publications” tab at the top left of the page.